Primary school enrolment in African countries is among the lowest in the world. *33 million primary school-aged children in Sub-Saharan Africa do not go to school, *18 million of these children are girls. 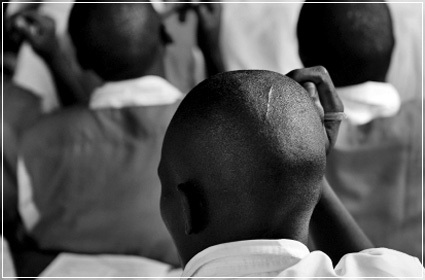 *In Sub-Saharan Africa, only two-thirds of children who start primary school reach the final grade. *Although literacy rates have greatly improved in Africa over the last few decades, approximately 40% of Africans over the age of 15, and 50% of women above the age of 25 are illiterate (Achieve in Africa, 2010). Education is an essential part of the project and development plan for the work of Village Foundations in the village of Ndanga. We recognise that education needs not only to be accessed by young children within a primary school, but should include training for all ages in all aspects of life including water management, improved agricultural methods and healthcare to develop and improve quality of life throughout the community. Education, whilst not compulsory in Malawi, has been identified as an area of priority within the vision plan to improve outcomes for children attending the local school in Ndanga. It is important for long term improvement and development that children are given the opportunity to access quality education from an early age which is continued if possible through to adulthood. The school within Ndanga village has 1366 pupils ranging from aged 5 to 17 and sees children educated not in the way we do in our schools in this country but on a much larger scale and with limited resources. To improve this and build on the good work achieved in Ndanga we are looking to develop a schools project involving primary and secondary schools in this country. The schools within the project will work together raising important funds which are needed to improve facilities within the school in Ndanga, whilst raising awareness of our children of the issues facing children in accessing an education in Malawi. This project is in its early stages but we already have schools interested in establishing a partnership who plan to work together and take a lead in developing a schools project for Village Foundations in the UK which will support and help development to work of the charity in Malawi. The first priority of this project will be to establish a schools fundraising programme. This will aim to financially support the priorities identified from the vision plan of Village Foundations to improve and build on the work already achieved within the primary school in Ndanga. Linking the schools within the UK schools programme with the Ndanga Primary School. Ensuring all children in the school have access to good quality water from the Ndanga school bore hole. Develop a school feeding programme within the school, aiming to build a school kitchen to provide the children with a meal whilst attending school. Provide equipment and supplies for the school to aid children's learning. For any improvements to be achieved we need to raise funds and this will be the priority of the schools project within the UK in the coming months. All funds raised through the UK schools project will be used to improve the facilities at the village school for the children accessing education in Ndanga.